Sort file:- Dover, December, 2018. Above shows Mail Packet in Woolcomber Street circa 1910. Above picture shows the house advertising Steven Marwick who was licensee from 1905 to 1907, and that may well be him in the doorway. From 1227 to 1467 channel packets would have obliged passengers from this area. That ended following cliff falls and the silting up of the estuary so that by the late fifteenth century, the Pent to the West was more accommodating. This number in 1852 read 15. The end is a mystery. It closed for the duration of hostilities in September 1940 but I found no evidence of it being destroyed or reopening either. If not before, it would have been removed in 1956. The German long-range guns fired on Dover. Two shells came over just before 01.00, one struck the rear of 60 Leyburne Road, damaging houses in Harold Terrace, while the other failed to explode on impact in the garden of St Ursulas Convent school, Castle Avenue. Fifteen minutes later another shell took out the back of 15 Park Avenue. Then one exploded on the foreshore of East Cliff. Half an hour went by before the next one exploded in the Paddock, off Maison Dieu Road, partially demolishing Nos 6 and 7, and injuring Miss Watson. The shelling was intermittent. The next salvo arrived about two hours later, wrecking the "Mail Packet" public house in Woolcomber Street, and also Hoppers Bakery. A small group of army personnel in vehicles had just arrived in Woolcomber Street when a shell exploded on the already battered St James's Church. There were four military and two civilian casualties. The last shell for the day arrived in the afternoon, wrecking Whyam House, in Maison Dieu Road and blocking Ashen Tree Lane. I think more or less sums up the demise of the pub and probably fortunately by being closed from September 1940, the shell that finally made the house unviable for reopening, as far as i am aware, also never injured anyone, as it obviously would have had it still been serving. From the Dover Express and East Kent Intelligencer, 11 January, 1867. Price 1d. William Saunders, a "mariner", was charged on suspicion with having broken into the premises of Mr. Christopher Wood, in Clarence Place, and stolen therefrom four fowls, his property. Police-constable William Fahye said he was on duty about a quarter to twelve on Saturday night, in Woolcomber Street, when he saw the prisoner cross the road near the Marine Place in the direction of the "Clarence Hotel" Gates and then go towards Marine House, and disappear down a passage. He emerged from the passage a short time afterwards and went up Woolcomber Street, witness meeting him near the "Mail Packet Inn." Prisoner was proceeding in the direction of his own house, in Trevanion Lane. Witness did not see him go into his house. He (Fahye) then went to the spot where he had first seen the prisoner, and found near the gates of the "Clarence Hotel" the two fowls produced. The fowls were warm and bleeding. He immediately ran back after the prisoner, but prisoner was not anywhere to be seen. He then took the fowls to the station-house and afterwards went to the passage he had seen the prisoner earlier, and he there found two more fowls, lying near the doorstep and about fifteen yards from the fowl-house of the prosecutor. He subsequently examined the fowl-house in company with police-sergeant Stevens. They found the staple broken and the door open. Witness saw blood and feathers in the fowl-house. He apprehended the prisoner, upon the Marine Parade on Sunday, morning. On charging him with stealing the fowls, he said he knew nothing about it. After getting to the station-house he examined a guernsey the prisoner was wearing at the time, and found marks which he believed to have been caused by blood. The prisoner said the marks were produced by tar. Prisoner declared he was in bed and asleep at the time the police officer said he saw him in the neighbourhood of the fowl-house. The witness, in reply to prisoner's questions, described how prisoner was dressed - in blue guernsey, dark trowsers, and cap, with a muffler round his neck. By the Bench: The prisoner passed me within five yards of the gas-lamp. Police-sergeant Stevens gave corroborative evidence as to the fowl-house having been broken open. Mr. Wood identified the fowls as his property. They were worth about 5s. Superintendent Coram, in justice to the prisoner, asked that the case might be adjourned, it being his impression, from the information he had received, that there was a mistake in identity. The prisoner repeated that he was in bed and asleep at the time mentioned. The Magistrates told him he had better not say anything then, and adjourned the further hearing till Friday (this day), accepting the prisoner's own recognizance's in £10 to appear. From the Dover Express and East Kent Intelligencer, 29 December, 1871. Price 1d. Mary Ann Francis Toombs, a married woman, and the eldest daughter of the deceased, said: The deceased was a labourer, and resided in Trevanion Street. He was living alone at the time of his death, as his wife was out nursing. I last saw my father conscious at three o'clock on Sunday afternoon. His health was then very good considering his age – sixty-eight. At eight o'clock on Sunday evening I went to see how he was getting on, as he was quite alone; and when I arrived at his residence I found there was no light. I lighted a candle, and went into the back room to search for him; but he was not there. I heard someone breathing in the kitchen; and on going there I found the deceased lying on the floor senseless, at the foot of the stairs. I washed him and laid him on a couch. I did not send for medical aid then, as I thought in all probability he would revive. I watched him during the whole night; and as he did not revive I sent for Dr. Gill. He did not come, so I sent for Dr. Duke, who came immediately. Dr. Duke told me that the deceased was paralysed, and had pressure on the brain. He remained alive up to yesterday morning, at half-past one, when he died. He was quite unconscious from Sunday till he died. I think the deceased had been out into the yard, and had fallen down in the kitchen on his way back. The back door was bolted previous to my father's going home; but it was not bolted when I found him. The deceased had to go down the kitchen stairs to reach the yard. By a Juryman: Someone assisted me to carry the deceased up from the kitchen. He was lying flat on his back when I found him. Edwin Duke deposed: I am a surgeon residing and practising in Dover. I was called to see the deceased on the morning of Christmas Day, between eight and nine o'clock, at No. 7, Trevanion Street. He was lying on the couch when I arrived. I examined him, and found an incised wound just above the right temple, with a severe contusion of the right eye. He was perfectly unconscious. I attended him at the time of his death, on the 27th inst. I attribute death to compression of the brain, caused by injuries sustained to the head. Death was not caused by a fit. By a Juryman: I was told that the deceased had fallen down in the kitchen. When I first saw him he was suffering from contusion of the brain, which ultimately led to compression, thereby causing death. Louisa Ford was brought up on remand charged with stealing linen. Ellen Johnson, wife of Charles Johnson, said: I am a laundress, and reside in Peter Street. The prisoner was in my employ eight months. I have missed several articles, but did not suspect the prisoner. Last Thursday, a woman told me something in consequence of which I sent her on an errand across the field and looked into her basket. I found in her basket a linen sheet. That was a sheet I had got to wash. When she came into the laundry again I said, “Mrs. Ford you have put one of my sheets in your basket, you will kindly take it out.” She went to her basket and took out the sheet. I said, “Don't you think you ought to be ashamed of yourself to rob a woman as poor as you are yourself?” She said, “I did not mean to rob you of it. I have wet my own sheet, and I am taking it away to use to-night, and would have brought it back to-morrow. In consequence of that, information was given to the Police by my husband. The sheet now produced belonged to Mrs. Brett, of the “Mail Packet Inn.” It was given me to wash about four weeks ago. I made it good. Another sheet produced belongs to a Mrs. Gillispie; it was also given me to wash. That was missing in June last. I had not replaced that. Here is another sheet which I believe belonged to Mrs. Carpenter. The hem has been cut off. I think it was hers, because it is like all others I have from her house. The corner, where the name was, has been cut out, and re-hemmed, being sewn with dirty whit cotton that has not been washed. Here is another sheet which belongs to Mrs. Amos, of the Marine Parade. The name has been picked out with scissors, and the hole sewn up. I have not replaced that. This fifth sheet, which is produced, belongs to Mrs. Payn, Buckland. It has the name on it, “30, Payn, 1845.” I ought to have sent that home on Saturday, so she must have taken that the week before last. The next article is an apron, which I missed three weeks ago. I found the fellow one to this, and told her I had found the apron I had lost, but I had not, for this is it. I had accused her of stealing it, and she denied it. The apron I found did belong to the same person as this one. She is a housekeeper at 4, Maison Dieu Road. I told the prisoner I was sorry I accused her of stealing the apron, and told her to come back to work, which she did. That was three weeks' ago. I think the sheets are worth about 5s. each. By Dr. Astley: I did not make enquiries amongst the women, because I thought it had been my own carelessness in sending them wrongly to the people I washed for, and that they would send them back. I have enquired of the people I wash for, and they said they had not got the things. The value of the articles is above 25s. Police-sergeant Hemmings deposed: I went with Mr. Johnson on Friday to Mrs. Ford's house. I saw the prisoner outside the door. She said “Come in; don't stand there.” We went upstairs into the prisoner's room, and Johnson said, “You know what we have come after.” She said, “I acknowledge taking the sheet, and you forgive me.” I said, “There are other things missing from Mr. Johnson's laundry. Have you any objection to our looking at your bed linen?” She said she had no objection, and begun to pull the sheets off the bed. Nothing was found there. Mr. Johnson said, “What pawn tickets have you got?” She went to a drawer, and took out a quantity of pawn tickets. There were twelve. I then asked what room was above the bedroom. She said it was a room that she occupied, and she consented to our searching it. On our going into the room, she picked up a sheet and carried it in front of her. This is the sheet identified as belonging to Mrs. Brett. The prisoner said the sheet belonged to her landlady. It was identified by Mr. Johnson as one his wife had to wash. I then enquired of the landlady, and she denied the ownership of the sheet. The prisoner then acknowledged stealing the sheet, and begged me to forgive her. I then took the prisoner to the Police-station. I then went to Mr. Long's, and found nothing there. I then went to Mr. Hart's and found the other sheets and the apron. I produce three of the tickets which I found amongst the twelve; they are all three for sheets, one date 25th January, 1877, another 22nd August, 1877, and another 17th November, 1877. The prisoner said she did not work for Mrs. Johnson until July, and that the sheet pawned in June was her own. Mrs. Cook, female searcher at the Police-station, said; I searched the prisoner on Friday morning. I found in her pocket a purse, a farthing, and two pawn tickets. The one relates to a pair of boots and the other to a sheet. The one relating to a sheet is dated February 14, 1878. The prisoner said the sheet belonged to the landlady. Henry Walford deposed: I am assistant to Mr. hart, the pawnbroker in Cannon Street. The prisoner has been in the habit of pawning things at our shop. On the 26th June, 1877, she pawned this sheet for 1s. The ticket is in the manager's handwriting. A sheet was also pawned on the 22nd of August. I took it is. She pawned it for 1s. On the 6th January, 1878, she pawned an apron with a pair or drawers and a pillow case. We lent 9d. on them. On the 14th of February she pawned another sheet. The manager took it in. I was present. She had 2s. upon it. They were all pledged in the name of Ford. The prisoner pleaded guilty, and was sentenced to be imprisoned for two months' with hard labour. The Mayor said he hoped it would be a caution to the prisoner for the future. The property was ordered to be given up to the owners. From the Dover Express and East Kent News, Friday, 8 April, 1887. Price 1d. 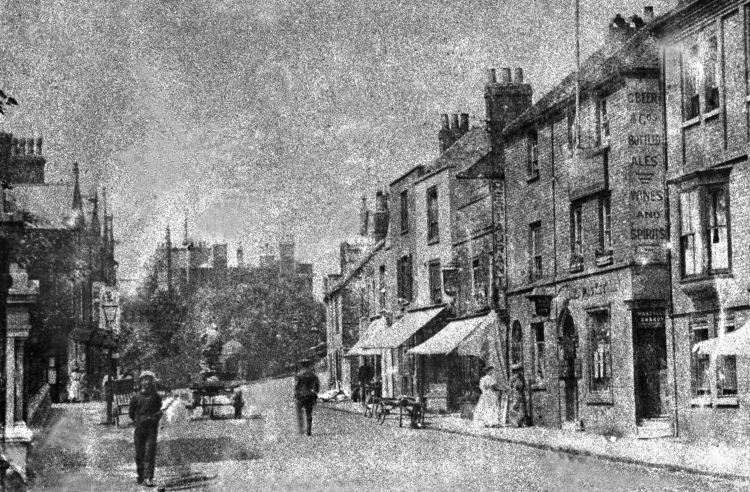 William Marsh, a labourer, living at 3, Trevanion Lane, was charged with being drunk and refusing to quit licensed premises, the “Mail Packet Inn,” Woolcomber Street; and also with breaking a pane of glass, value £2 5s., the property of Mr. Baker. 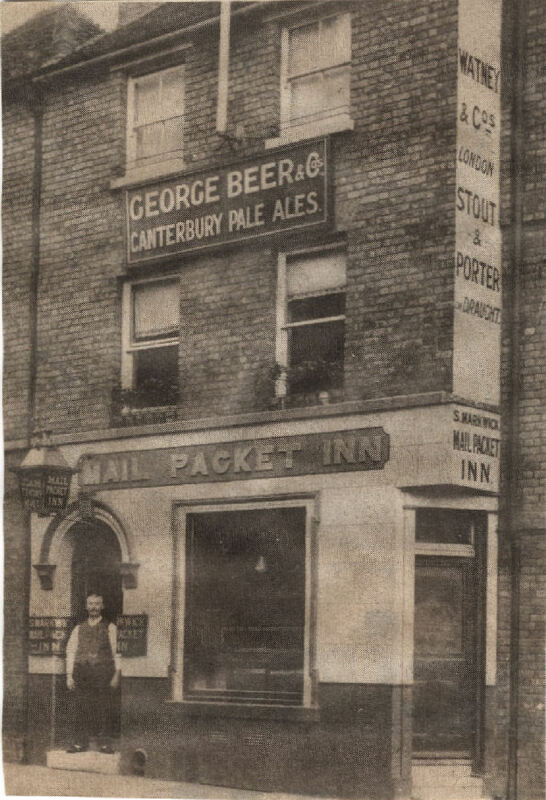 Henry Baker, landlord of the “Mail Packet,” said: On Saturday evening, about nine o'clock, prisoner came into the bar and asked for a pint of beer. I refused to serve him as he was drunk at the time and had been fighting. He then started quarrelling with some customers in the bar and I asked him to leave, but he refused to do so. He was taken home by one of the customers, but afterwards came back and began fighting. He then struck the pane of glass and smashed it. He used very bad language and I had him taken into custody. Edward Nicholls, a fish hawker, stated that he was outside the “Mail Packet” on Saturday evening and saw Marsh creating a disturbance. Witness saw him break the pane of glass. Prisoner, who had been previously convicted was sentenced to one month's imprisonment with hard labour. Whitstable Times and Herne Bay Herald, Saturday 29 December 1888. Re Henry Cannon Baker, Dover, Licensed Victualler. Debtor formerly kept a public house in Woolcomber Street, Dover. He said he took it 6 years ago. He borrowed £120 from Mr. Claris, solicitor, to go in, and this he paid back in the first year. He paid £547 in all to go in, but he was "fairly robbed." He gave up possession about 4 months ago. He denied that Messrs. Beer and Co., of the Star Brewery, Canterbury, pressed him or served him with a writ before he left. A Mr. Twigg took the house of him, and the balance of the evaluation money was paid to his wife - £80 odd. He paid several of his creditors, and then gave his wife what was left over. He denied again that Messrs. Beer and Co. were pressing him at the time, and also that Messrs. Mowll and Mowll's clerk came to see him about Beer and Co. debt before he got out of the house. He gave the balance of the money to his wife because it was her money before he married her. Upon the application of the Official Receiver, the registrar adjourned the public examination for a fortnight. From the Dover Express and East Kent News. 10 June, 1938. Price 1½d. The Magistrates' Clerk said that it would be advisable if the plans were first approved by the Town Council. The plans were agreed subject, to the approval of the Town Council. From an email sent 14 August, 2011. I have just found out that my aunt's father Charlie Fiddler was the landlord of the "Mail Packet" just before the war. Charlie had previously been the Landlord of the “Lads of the Village” in Woolage Village about 7 miles south east of Canterbury, Kent. His wife went by the name of Nellie. 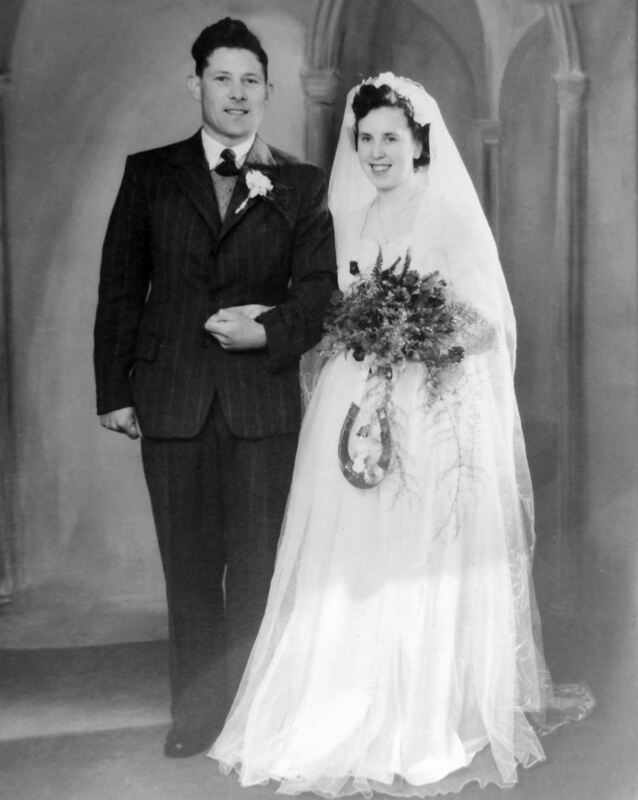 I am enclosing two photos, the wedding photo is of his daughter Joy. She married Edward Dawkins, Edward was the nephew of Percy of the "White Lion." Charlie's son was called Sonny and has not been heard for over 50 years. From an email sent 17 January, 2012. Just to let you know that Joy Dawkins Nee Fiddler passed away yesterday the 16th January 2012. 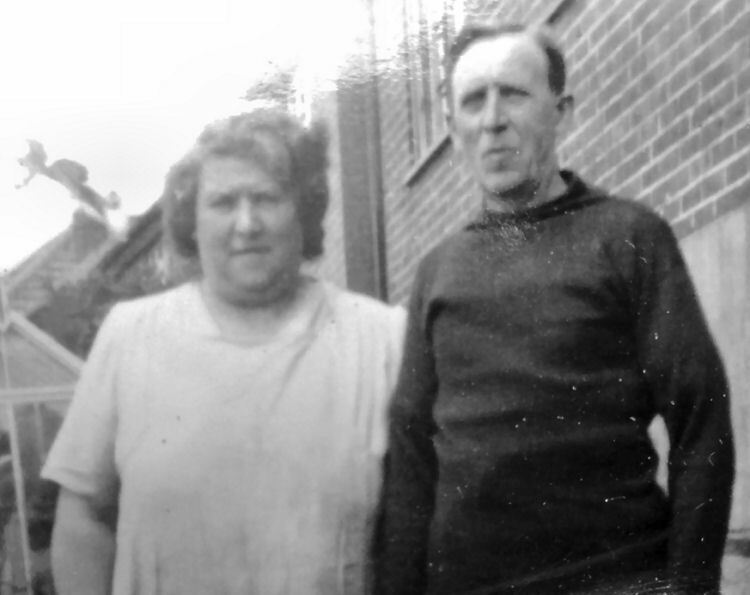 JARRETT Frank Dec/1935-37 end (Of Cranbrooks, Mersham, near Ashford, a market gardener. According to the Dover Express, 1935, Frank Jarrett used to be a market gardener from "Cranbrooks," Mersham near Ashford before becoming the licensee.